Poster design Liz Mills and Jamie Maskall. Urinetown is set in a future where the government takes advantage of a terrible water-shortage by banning private toilets. 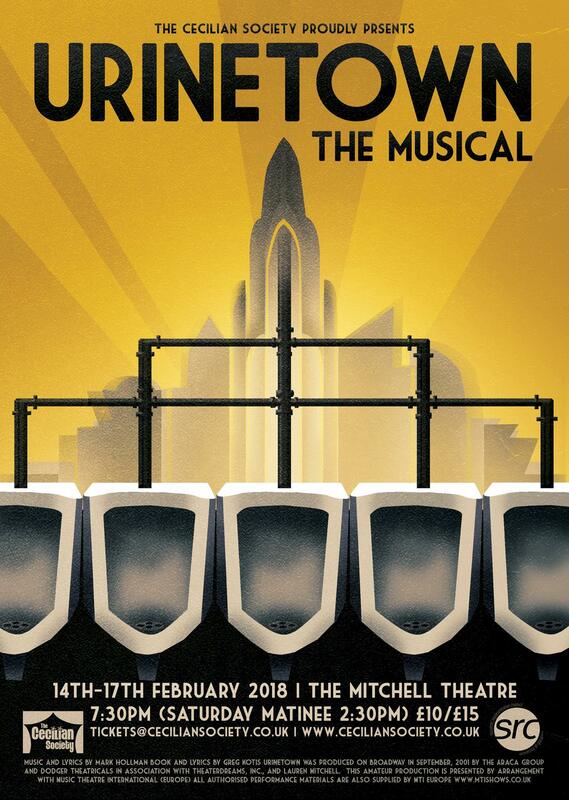 Citizens are forced to pay to use public toilets instead, and those who refuse are exiled to Urinetown. The public amenities are regulated by Mr Cladwell and his megacorporation Urine Good Company, who profit by charging admission for one of humanity’s most basic needs. Urinetown tells the story of Bobby Strong’s journey towards freedom and justice, as he leads a gang of misfits in a revolt against the system. This outrageous musical has everything from big dance numbers to heartbreaking solos, all with a dark satirical twist.